This page doesn’t photograph all that great but if you look at the larger image by clicking on the smaller one you can see some detail better. There are three stampings of my styrofoam plate image of Guadalupe that I carved several months ago, all these stampings are in blue. And then there are three stampings in black of a rubber stamp that I have of Guadalupe. 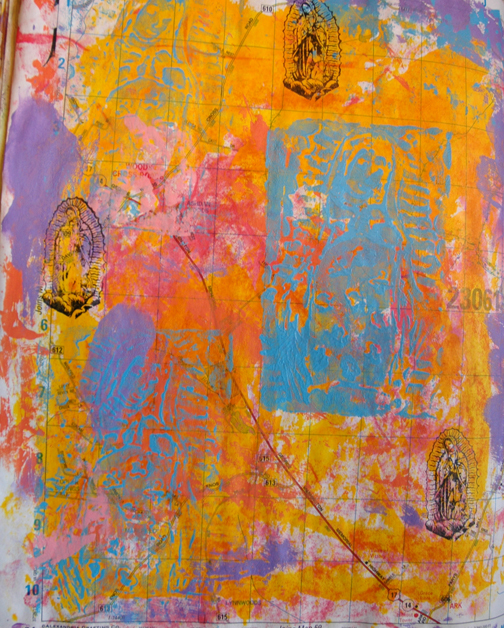 The background is tempera paint and the styrofoam plate stamps are tempera, too. Tempera is one of my favorite paints to use in art journaling. It dries matte which I like. It dries more quickly than acrylic, which I like. The paints mix well, which I like because the color range is somewhat limited. It’s non toxic and non stinky, which I like. In summation, I LIKE it. It’s inexpensive, too, which I REALLY like. Try it. My go to if I am not trying to prep a surface is white tempera which dries semi-opaque in one coat, opaque in two, much quicker than gesso and much more reasonably priced. 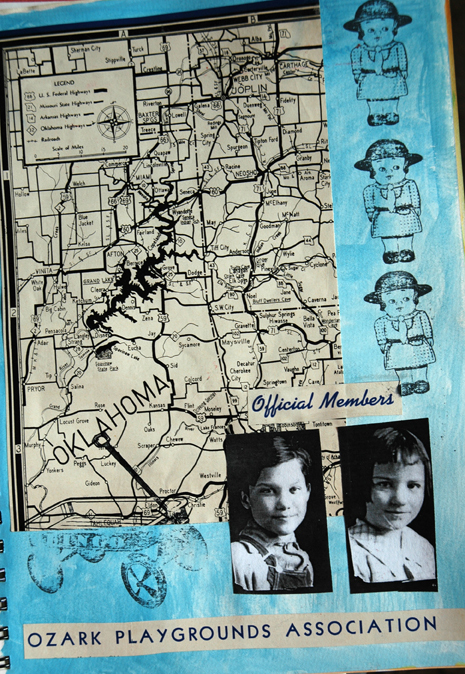 Just about every page in my altered map journal begins with white tempera paint. I believe I said earlier this week when presenting Albert the doll that when I say I have “a lot” of something it is likely to be an insane amount. 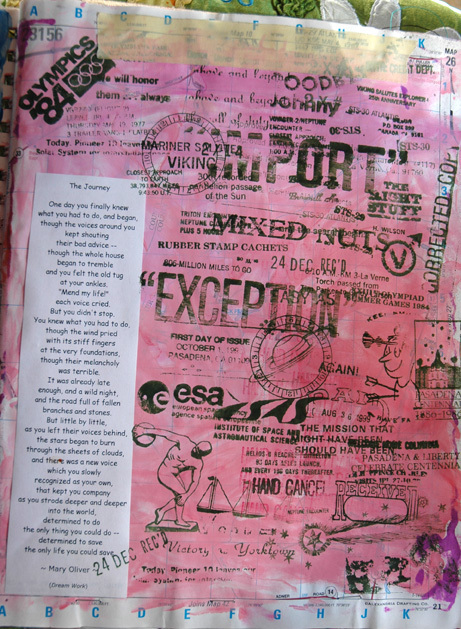 Such is the case with this art journal page. More than a decade ago I procured a lot of stamps from Ebay and a box from a local used office supply shop. The stamps range in content from images for advertising to medicine to the Olympic games and a space shuttle mission. The text varies from “mixed nuts” to post office sayings to “import” and “export”. My goal was to see which of these antiquities still would print with a regular ink pad under normal conditions. Most of them did, leaving me with this busy page of black inked wonders. I topped the page off with one of my favorite poems by Mary Oliver printed off the Internet. I like this page with its random DADA meaninglessness, graphics printed in simple black ink and old style mid-last-century appearance. Last summer we had epic rain which resulted in the spawn of mosquito larvae on our flat roof which was holding puddles of water. About this time, dragonflies reached all time highs in populations and record breaking sizes and colors. I even saw a rare for this area bright red dragonfly; most of them here are an iridescent greenish-blue or brown. It was not unusual to see dragonflies last summer the size of birds, and in packs of 50+ swarming the backyard. If I had an ounce less of dragonfly love it would have been positively creepy and The Mist-y. 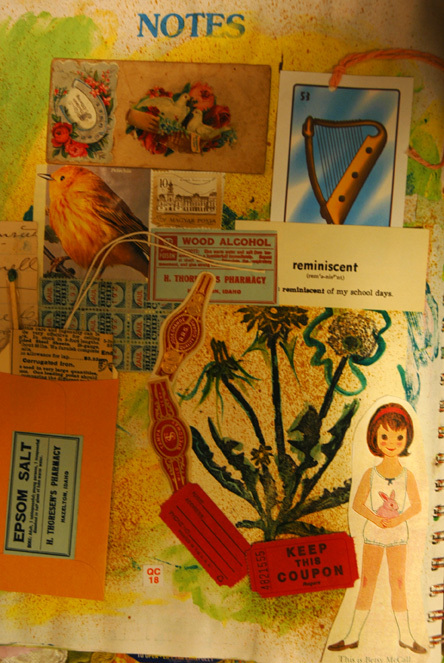 I commemorated one dragonfly filled day with this journal page. 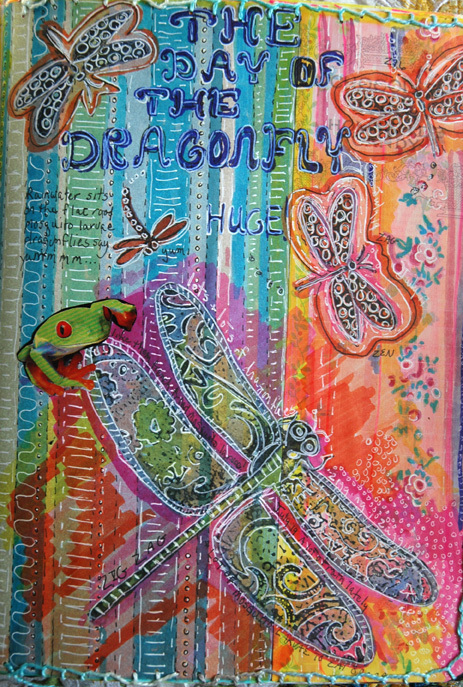 I have a ginormous dragonfly stamp and did a lot of coloring with marker over top of already pretty scrapbooking paper. Patterns and lines were made using a white gel pen and I found a cute tree frog in a magazine to paste onto a wing looking like he was getting a free ride. Whee! I sewed around the edge of the page when it was finished with a blanket stitch. I love this page because it reminds me of a real day in the backyard enjoying nature and because of all the summer colors in it.